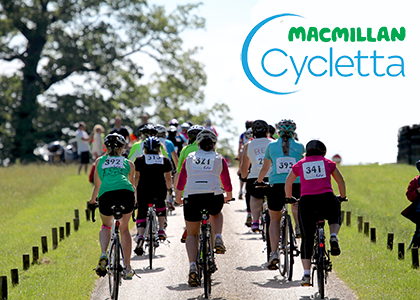 If you’ve decided to step up to one of the longer Macmillan Cycletta distances then it’s important to try and follow a structured training plan; this will ensure you arrive at the start line confident and really to take on the distance, and just as importantly, will mean you can relax and enjoy the experience! Warming up – It is incredibly important to warm up before cycling. It is not only the legs and bum that take the strain during cycling, your back, neck and arms also work hard. Light aerobic exercise (easy cycling) followed by stretching helps ease you into action. Stretching before getting on the bike helps to prevent injury, improves your range of motion and enhances performance. Cooling down – Cooling down after you cycle is just as important in reducing the risk of injury as warming up. Gentle exercise after a cycle gradually brings the body down to a pre-cycling state, and helps the heart rate and breathing return to normal. Try a few gentle stretches, similar to those performed before the ride and think of cooling-down as a warm-up for your next ride. 1. Hard interval cycling session. Interval training means changing how hard you are cycling from easy to very hard for different lengths of time. Interspersing periods of hard cycling with easier cycling is a great way to improve your aerobic fitness and cycling strength and speed. 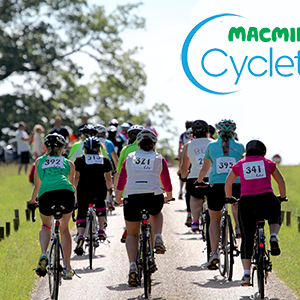 There are a number of different ways of interval training: you can try a spinning class, the bike at your gym (most bikes have an interval programme), your own bike on a turbo trainer (a device for holding your back wheel allowing you to cycle without moving anywhere – great for training at home, indoors or outdoors), or on the road. 2. Aerobic session. To help you avoid overuse injuries in the early part of your training use different types of aerobic exercise including swimming, running or an aerobics class. 3. Strength session. These are best undertaken at your local gym. Seek advice from a personal trainer if you have no experience and/or you want some expert advice and support. Circuit training is a fantastic way to improve strength, and strength endurance, and training in a group can be a bit more interesting and fun. Remember never lift weights on your own. The focus of your strength training should be your legs, bum and tum, although adding in upper exercise won’t hurt in the early days to improve your general conditioning. Core stability is also important to improve your performance and help avoid injury. 4. Cycle session. During the cycle sessions you should aim for an intensity that allows you to just manage to hold a full conversation – it shouldn’t be so easy that you can talk continuously yet at the same time it shouldn’t be too hard that you have to stop mid-way through a sentence to catch your breath. 5. Tempo ride. The idea of a tempo ride is for you to go as hard as you possibly can for a fixed period of time – you should choose an intensity that means you can only just hold on for the target time. This programme gives you a structure that you can adapt to suit your own lifestyle and current training levels. Make sure you rest in between days or at least 2 days a week if you are at comfortable at that level. Don’t panic if you miss a week or so due to illness, all programmes are designed to account for this – just miss that week and start back on the correct week. If you feel an injury or even a niggle then rest, if it doesn’t ease in a few days then see a specialist – it’s completely counter-productive to carry on training and there are plenty of other events to enter if you have to miss this one. 1 x Interval training session: 10 minutes warm-up/10 minutes hard/3 minutes easy/8 minutes hard/3 minutes easy/6 minutes hard/2 minutes easy/4 minutes hard/2 minutes easy/2 minutes hard/10 minutes cool down.